This motivational jiu jitsu poster is sure to grab the attention of anyone walking by. Hang it in your office, gym, or even your bedroom to show off your pride in the great art of Brazilian jiu jitsu. High quality posters printed in full color. These are printed to the size of 11x17 inches. Makes a great gift for jiu jitsu grapplers or BJJ instructors. 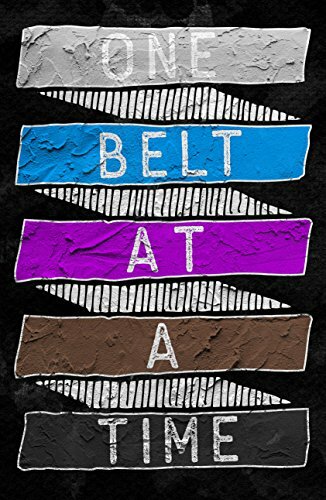 SHOW IT OFF - This 11 x 17 inch poster beautifully displays the quote "One Belt At A Time". Great to show off to your family, friends, and guests! MOTIVATIONAL - Perfect gift for kids or adults who enjoy practicing their Brazilian jiu jitsu skills or any other forms for martial arts and grappling. HIGH QUALITY - Our posters are printed on strong 150gsm coated paper. Beautiful and vibrant colors will be sure to pop out while on display. Every poster is original and created by our small personal team of designers. MADE IN THE USA - All products by Damdekoli are printed and manufactured in the USA on a large commercial grade digital press. Framing and hanging equipment are not included. MONEY BACK GUARANTEE - All returns are accepted if you are not satisfied with the product, service, or quality we provide. If you have any questions about this product by Damdekoli, contact us by completing and submitting the form below. If you are looking for a specif part number, please include it with your message. Revolution Come and Take It Military Vintage Flag Black Framed Canvas Print Home Decor Wall Art Gifts Signs Cards 19"x27"
Canvas on Demand Premium Thick-Wrap Canvas Wall Art Print entitled Cognac Monnet Vintage Advertising Poster 18"x24"
Canvas on Demand Premium Thick-Wrap Canvas Wall Art Print entitled Ingham Marsala Wine Vintage Advertising Poster 30"x40"